The knee is the largest and most complex joint of the human body. It is exposed to large forces and is therefore prone to several degenerative diseases. Lesions often require surgical intervention (e.g. total knee replacement). Immediately following knee surgery, a rehabilitation program is started to regain full knee mobility and flexibility. Clinical research suggests that mobilization of the patella may be effective to prevent the formation of adhesions within the knee joint. To relieve the physiotherapist from the tedious process of manually moving the patella and to assist the patient during home exercises, the ILT has developed an automated knee rehabilitation device in collaboration with clinical partners. 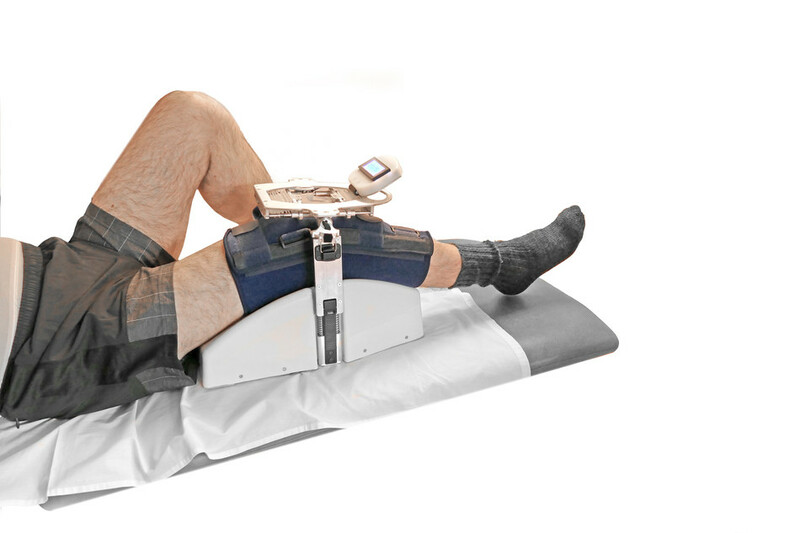 The knee rehabilitation device is an integrated system comprising a leg support with all necessary electronic and pneumatic components, a snap-in mobilization system for patellar handling and a biofeedback app. For a simple installation of the leg, the complete mobilization unit can be removed from the leg support. The mobilization unit is based on a pneumatic air cushion system consisting of two vis-à-vis arranged air cushions which are driven by a micro pump. Dedicated soft silicone grippers have been designed to allow firm gripping and handling of the patella. The surface material can be cleaned and disinfected with common detergents. The biofeedback app provides the user with information about the current pressure applied to the patella. The pressure data is transmitted directly from the Patello to an Android application. 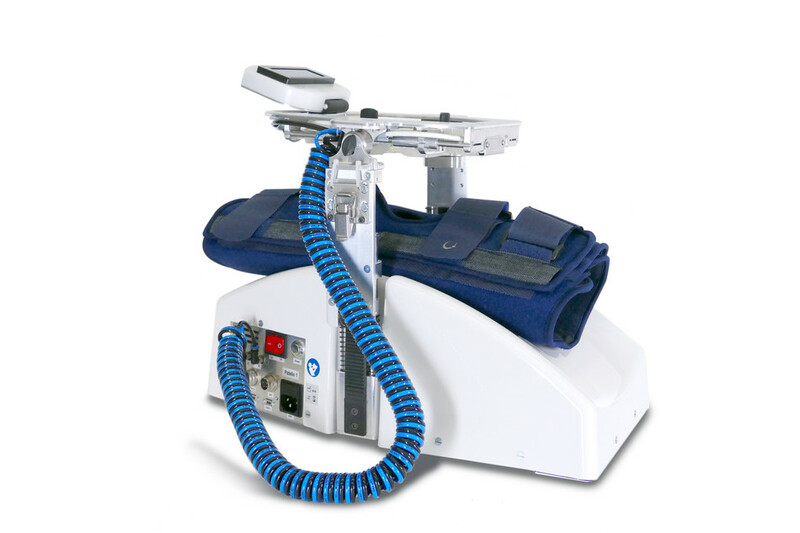 The therapy device mimics the manual therapy that is carried out by the physiotherapist. The device can be used for both right and left legs and for various leg sizes. The distance and applied pressure for the patella displacements can be set individually by the user with the easy-to-use manual control unit. The mobilization can be carried out for any duration suggested by medical experts while the patient is sitting or lying. An automated knee rehabilitation device has been developed and realized in close collaboration with clinics and physical therapists. The device has been tested on patients few weeks after their total knee joint replacement for prevention of adhesions in the knee joint. The results of the trials have confirmed both the feasibility of the automated patella mobilization and a high level of usability.